I have succumbed to the world of knits. Knits, you are now my friend, I am no longer scared of you. So there, I’m finally getting used to knits bit by bit. I think with each attempt I get more and more comfortable. I can’t even remember where I was reading, but one day I jumped on Patterns by Figgy’s site and bought the super cute tee for two pattern. 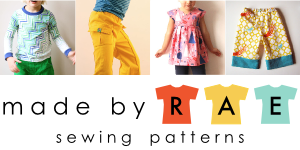 Here’s a link to where you can purchase the patterns. For whatever reason I hadn’t given the pattern much thought, and I know I’ve seen people using the pattern all over the place. I’m so glad I looked at it more. I didn’t realize the pattern came with a dress option, long sleeve option, and different short sleeve options! Holy moly, this pattern is loaded with goodness. It’s also awesome that the size range is 12 months to a 6/7, even better. I also love that there’s no hemming, it’s all raw edges on the sleeves and bottom and that the seams are raw edge exposed. Nice and comfy. Are they coming out in adult sizes soon? I hope. Anyway, my first trial was a little dress for Emily. Simple, blue and soft. She loves it. I was thinking of doing some embellishing, but I think it’s cute as it is, too. Plus she’s all about layering a dress over anything she wears these days. I also got to chatting with Shelly, owner of Patterns by Figgy’s, because I was pretty excited about the pattern, and she is really so nice. So, just keep your eye out for some fun little surprises coming up soon! and take a look at miss grumpy pants who was pouting on the bed because she didn’t get a blue dress…patience my dear, patience! Your daughter will probably find a way to get back at you some day for posting that photo! I love it! I’m going to check out that pattern too. She is so cute posing or shall I say modelling your creation so you’d better get cracking and make t’other lassie something similar. Love the knit shirt, still working my way with them – they can get a little wonky when I work with them – but I know practice makes perfect! I bought this pattern recently but haven’t gotten around to making anything yet. It’s so sooo cute! My kiddos are pretty much the same – always wanting something handmade if the other gets something. Though I have a boy and a girl so they don’t always want exactly the same things! Adorable! My girls are out of that size range now. If only Cooper could pull off dresses… oh wait, that’s probably something I shouldn’t wish for. I’m so happy to read that you like it! Keep them coming! I know this isn’t the point of the post…but…I’m loving that pillow! What a fabulous post! A treasure! Adorable dress! Great work! And… I love that your daughter has mis-matched socks on. That’s our house every day! How adorable! And your little girls are incredibly cute:). ACK, isn’t she amazingly adorable! Wow, very cute look too. Lovely pics. I am loving sewing knits as well! Finally- clothes I can make for my boy! your little dress is too cute. And that little model- she just makes it, doesn’t she? Also- love the big pillows with Anna’s fabric. LOVE. Great pattern, isn’t it? And Shelly really is soooo nice. Great job on the dress! Oh it’s so cute! I want to make more things for the kids with knits but I never know what to do about the neckline. Last time I stole the neck of one of my son’s old shirts. I have never worked with knits before. I am scared of working with them. Too stretchy; however, you have given me hope and maybe I will try. Last pic reminds me of me when I was little. My mom used to make all our clothes and if my sister got something and i didn’t, I was all pouty faced too. And that ottoman. I LOVE it. If you ever want it, let me know!!! So cute. I like the pillows too. It looks like your little one had a lot of fun. You are brave… I am still too afraid to try sewing on knit. Such a fun post Anna with the great photos accompanying it! Way back, I used to sew knits all the time for bot my kids. I’ll have to start over now with the grandchildren! I’ll be watching what you do. What did you use at the top? Did you make knit bias tape? i am so excited about u sewing with knits. can’t even wait 🙂 and this pattern is a must have before my daughter grows outta this 4. This is my absolute favorite pattern, and this was the first thing I made using knits. They did such a great job showing just how easy they can be to sew with. Since my little one is still, well – little, I often scour the clearance racks at Target for the XXXXL clothes to cut up and use for material. There’s always plenty to spare! Adorable!! You have more courage than me- I look at the knits and don’t touch! LOL! Maybe someday! :) Love the pics of the girls- even grumpy pants!! So cute and fresh! I think I need a serger now… love it. love the color. love that blond hair! What? She doesn’t care about those lovely pillows where she lays her head? Have you seen the awesome Japanese knits yet. Now you’re going to be broke. Yay knits! One cat out of the bag at a time. Or should I say, Let all the cats out. I’m thinking since you posted about knits there will be a surge in knit sewing this month. That is so cute and looks so comfortable. Wouldn’t it make a cute nightgown, too? And poor miss grumpy pants!! !